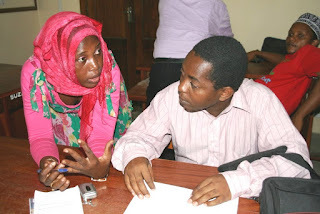 Here are some more pictures from the internet training for journalists from Zanzibar. Above Haji Nassor, reporter of Television Zanzibar from Chake Chake, Pemba. 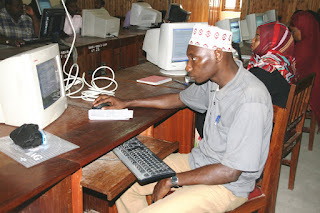 Behind Saumu Shaaban from Media Council of Zanzibar. Ali Mbarouk on the left is a journalist based is Chake Chake, Pemba, and also information officer for Zanzibar AIDS Commission. 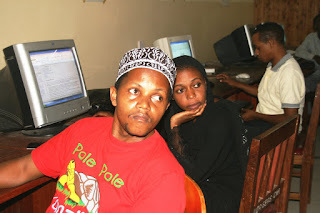 Behind him is Zaituni Makwali, radio journalist at Chuchu FM, and Ramadhan Suleiman from Zanzibar Leo. 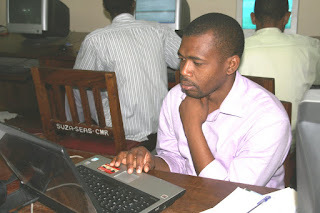 Above is Abdallah Mitawi, news editor of Television Zanzibar TVZ, working with his laptop at SUZA. And here Asya Sharif Omar, Radio Zanzibar correspondent in Wete, Pemba, is sharing her ideas with Marko Gideon, MISA-Tanzania. All photos by Maggid Mjengwa.